How does a nerve synapse work? Nerve cells make vesicles made of lipids where they package neurotransmitter. The merging of the vesicles with the membrane itself is done using SNARE proteins and synaptotagmin as can be seen below. You can see the location where the Ca2+ ion on synaptotagmin. The merging of the vesicle with lipid membrane will then release the neurotransmitter into the synapse junction. 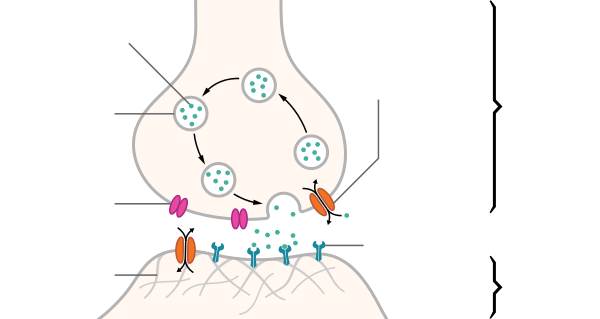 On the receiving end of the junction, there are receptor that can bond with different neurotransmitters; acetylcholine, dopamine, GABA and lots more. There are two types of receptors; metabotropic receptor (made of G-protein coupled receptor) and ionotropic receptor. Metabotropic receptors control an intracellular signalling inside the nerve cell. Meanwhile, ionotropic receptor contribute to flow of ions into the nerve cells. The seven helix groups/domains are transmembrane group as can be seen in picture below.